Well, I’m still in Bamako, Mali and it’s starting to look like I’ll be able to leave before Chritmas (*knock on wood*). I’ve been stuck doing the bureaucratic two-step over a project I’m going to be announcing this upcoming week and it’s been insanely mind-numbing and frustrating. Really, I want to get out of this country as soon as possible, not because I don’t like it, but because I feel like something could go down in the next month or so in regards to the current conflict in the north. Last week the Prime Minister was removed from office and the President’s party headquarters were shot up, apparently by a military that wants to intervene in the north as soon as possible and without the aid of foreign troops. While travelling Mali in the time of conflict has been interesting, and taking a bit of a travelcation in Bamako has been nice, I’m ready to hit the road again. I am dying for the chance to explore a little bit more again and most of all I’m dying to get to start seeing some wildlife again. Where I’m headed next is Burkina Faso and I’m told that there’s the possibility that I’ll be able to see some elephants there which would be very cool. For now, I have to settle for this crocodile I saw while in Segou. Anyways, cross your fingers and hope that everything goes smooth so I can leave town this coming week! If you don’t believe in the “good glass” thought in photography, where lens quality is much more important than the quality of the body, then you’ve never played around with a canon 70-200mm f/2.8. Seriously, the lens is absolutely magic. It is fast, takes clean sharp images and makes the colours pop. This image was shot in really low light, but I didn’t want to blur too much of the frame so I shot at f/4. I boosted the ISO to 400 to compensate a bit for the low light. But the most important thing I did was find a place to rest the tip of the camera lens to reduce the shake in the photo. Then it just comes down to composition which I executed pretty traditionally: focus on the eyes, put the eyes at 2/3rds point of the photo, and make sure there aren’t any distracting elements in the photo. 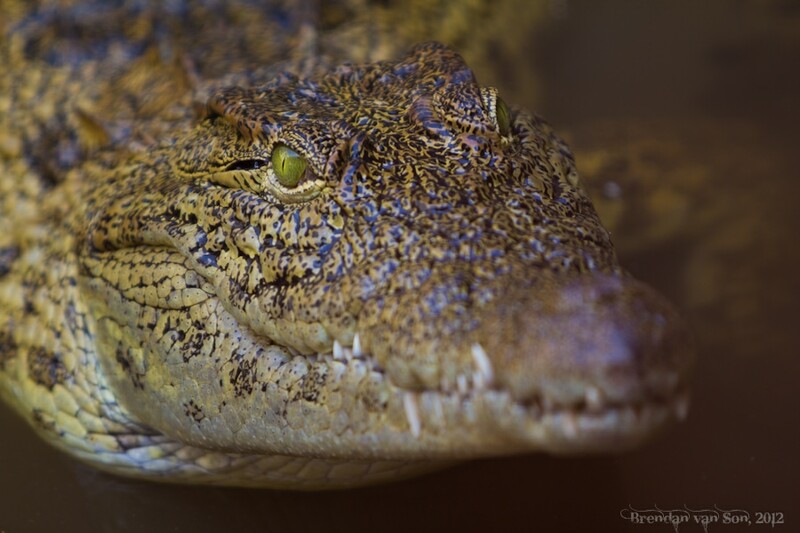 And voila, a beautiful photo of a crocodile! Beautiful photo. I hope you turned the flash off before you took the shot… you wouldn’t want to make him angry!